Hungry? Think small plates of tasty foods that continue to arrive at your table while you kick back with a good glass of wine and enjoy friends’ company. Are you hungry? If not, you will be by the end of this. Think small plates of tasty foods that continue to arrive at your table while you kick back with a good glass of wine and enjoy friends’ company. Tapas have grown in popularity in North America in recent years. You may have even have dined at a Tapas establishment right here in Canada. 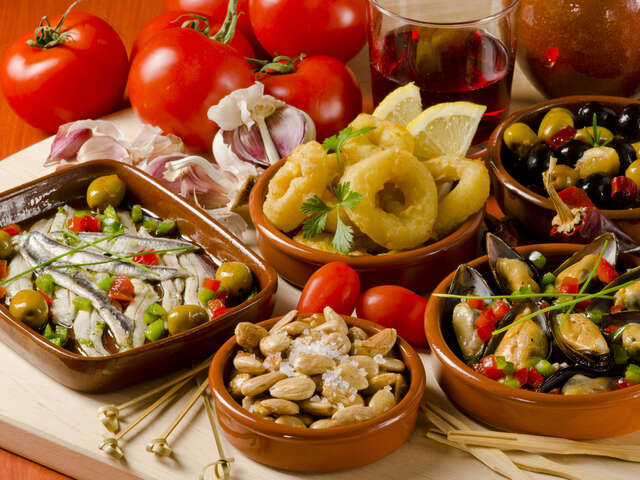 However, Tapas are an Andalusian way of eating as Andalusia, a southern region in Spain, is truly the home of tapas. 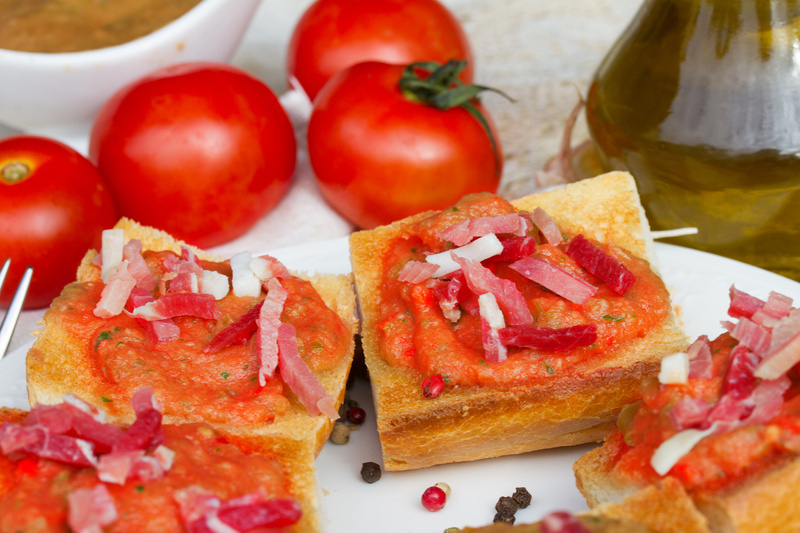 An interesting fact, in Spain tapas are never served at home or in restaurants. 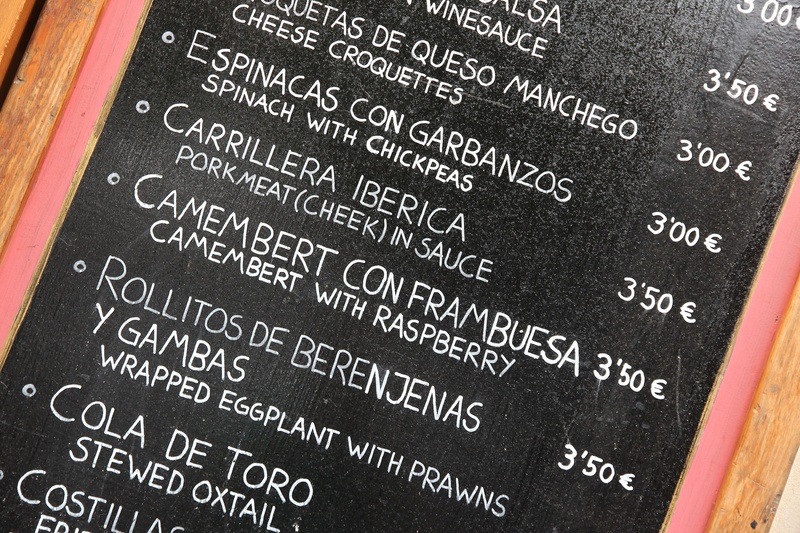 They are served in tapas bars are called tasca. Spaniards, when not enjoying a home cooked meal, will leave their homes as evening falls to spend a night out with their friends. They first meet up at tapas bars, where they may bar hop, eating and drinking different tapas before they settle into their restaurant for the evening. Cosas de picar (meaning “things to nibble”) basically refer to finger food, the most famous being the olive-the quintessential Spanish and, in fact, Mediterranean finger food. If a utensil (like banderillas, decorated toothpicks that get their name because they look like the darts used in a bullfight) is required to eat the food, the tapa is called pinchos. Cazuelas (little dishes) are tapas that usually come in sauce, for example, albóndigas (meatballs) or shrimp fried in garlic. Tapas are not so much a kind of food as a Spanish way of eating. It is difficult to convey the exuberant liveliness of a tapas bar because they are not just about drinking wine and not just about eating little foods. A tapas bar is more a window into the Spanish soul and the Spanish gastronomic mentality.